Secondary education in France falls under the jurisdiction of the French Ministry of Education and is standardized and centralized in its organization. Compulsory education starts at the age of six, when students enter primary school, and ends at the age of 16, usually after completion of collège. A majority of students go on to attend a lycée, but entrance is based upon achievement and successful completion of the collège curriculum. Such success includes an examination, but also the evaluation of a conseil de classe (class council), comprised of teachers, administrators, and fellow students. The lycée prepares the student to pass the baccalauréat (known as le bac); this allows the student to continue to higher education, studies in technology, or directly enter their profession, depending on the type of baccalauréat. Public French universities are required to accept any student who attains the baccalauréat général. However, there are also Grandes écoles, elite higher education establishments which function outside of the public university system, that traditionally have produced France's highest ranking politicians, executives, and scientists. Entrance to these institutions requires classes préparatoires aux grandes écoles, two to three-year courses, often offered by historical, prestigious, and selective lycées. Thus, despite the standardization and apparent equality of the public school system, which extends all the way through higher education, vestiges of the elite system of the old aristocratic order of the Ancien Régime remain, raising the question of selectivity versus equal opportunity. The French school system originally was established to further the education of the most talented, particularly focusing on those who were able and interested in pursuing higher education. The abuse of the system by the those with wealth and/or power is unfortunate. As humankind has advanced, the French education system has been reformed to better serve all members of French society. To achieve success, however, it must continue to adapt and find ways to support the different types of education that best match the needs and talents of everyone. A lycée in Rennes, from the nineteenth century. the collèges comprise the first four years of secondary education from the ages of 11 to 15; upon successful completion of this program, pupils enter a lycée. the lycées provide a three-year course of further secondary education for children between the ages of 15 and 18. Pupils are prepared for the baccalauréat degree, which upon completion can lead to higher education studies or directly to professional life. In contrast to most other education systems, the French use a decreasing numerical system in naming the various school years. Pupils begin their secondary education in the sixième (form six), and transfer to a lycée in the seconde (form two), while the final year is the terminale. French parents are not free to choose the public school that their children will attend; unless said children have special pedagogical needs, they will attend the school allocated to them by the carte scolaire (school map). Reasons for attending a different public school, other than the local assigned one, include studying a unique elective (such as a rare foreign language) unavailable in the assigned school. The collège is the first level of secondary education in the French educational system. A child attending collège is called collégien (boy) or collégienne (girl). Men and women teachers at the collège- and lycée-level are called professeur (no official feminine professional form exists in France). Entry into the sixième year occurs directly after the last year of primary school, called cours moyen deuxième année (CM2). There is no entrance examination into collège, yet administrators have established a comprehensive academic examination for pupils starting sixième. The purpose of the examination is evaluating the pupil's level on being graduated from primary school. Along with three-to-four weekly hours of physical education, a typical school week consists of some twenty-six (26) hours of schooling. French language and literature occupy the most time, four to five hours per week; followed by mathematics, four hours per week; other subjects occupy some 1.0-3.5 hours per week. The curriculum is devised by the French Ministry of National Education and applies to all collèges in France and also for AEFE-dependent institutions. Académies and individual schools have little margin for curriculum customization. Teachers compose syllabi per precise government educational regulations, and choose textbooks accordingly; every major French publishing house has a textbook branch. Each subject usually is taught by a different professeur (teacher); most professeurs teach different age groups. Collège students sit with the same group of students throughout the school year, and in every subject (except optional courses, such as foreign languages where students from several groups mix). Therefore, in each grade, pupils are divided into as many classes as necessary, because there exists a strong pedagogical belief in mixed-ability classes. Class size varies from school to school, but usually ranges between 20-35 pupils. Each classe has a professeur principal (principal professor) who is the link among the faculty, the administration, and the pupils. Early in the school year, the students elect two délégués (delegates) and two suppléants (substitutes) from their own classes. They represent the pupils in the class council, acting as links between the students and the principal professor (head teacher). Professeurs, administrators, and delegates of each grade meet three times a year in conseil de classe (class council). In those meetings they discuss the individual level of each student, and of the class, and matters of logistics and discipline inherent to the group of pupils. It is during those meetings that the conseil de classe bestows either honors or warnings on the bulletin de note (report card). Ultimately, the role of the collège is to prepare students for the advanced subjects of the lycée. At the end of troisième, students sit for le diplôme national du Brevet, an end-of-collège examaniation. 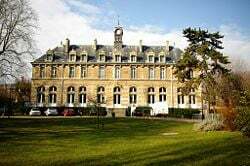 However, the brevet is not required for entrance to the lycée, nor does passing it guarantee that a student will progress to the higher-level school. he or she can, in specific cases, be offered to skip over a grade and be promoted two grades. A student asked to repeat a grade can appeal the decision for review, with the decision of the appeals council being final. The lycée is the second, and last, stage of secondary education in the French educational system. In France, the lycée général is the usual stepping stone to university degrees. The seconde is a link-year during which students make their final choice of série (academic stream) for the final two years. During the seconde, all students take the same courses, despite having different intellectual and academic skills and interests. Therefore, that schooling year usually is deemed easier than either the première or the terminale. At the end of the final year (terminale) of schooling, most students take the baccalauréat (pronounced [bakaloʀeˈa]), often known in France colloquially as le bac, the end-of-lycée diploma students sit for in order to enter university, a classe préparatoire, or professional life. 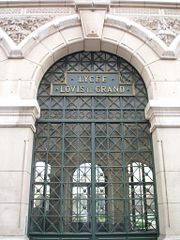 Front entrance of the Lycée Louis-le-Grand, in Paris, one of the most famous lycées providing preparatory classes for grandes écoles. The French educational system is complicated by the fact that in addition to universities there are also Grandes écoles (literally "Grand Schools" or "Elite Schools"). They have traditionally produced most of France's high ranking civil servants, politicians, and executives as well as many scientists and philosophers. These are higher education establishments outside the mainstream framework of the public university system. Unlike French public universities which have an obligation to accept all candidates of the same region who hold a baccalauréat in the appropriate academic field, the selection criteria of Grandes écoles rests mainly on competitive written and oral exams, undertaken by students of dedicated preparatory classes. These classes préparatoires aux grandes écoles (CPGE) are two to three-year courses, often offered by historical, prestigious, and selective lycées. There are several such lycées in Paris, including Lycée Henri-IV and Lycée Louis-le-Grand. The Lycée Louis-le-Grand offers both a high school curriculum (a lycée with 800 pupils), and a college-level curriculum (classes préparatoires with 900 students), preparing students for entrance to the elite Grandes Écoles. baccalauréat technologique- Short-term studies in differing technology fields. Each of these different baccalauréats are prepared for by specific streams of study, known as séries, which are chosen in the seconde year of school. The decision of which type of education to enter is based upon the wishes of the student, his/her family, and a review by the admissions council of the student's previous work. Most students sit for the baccalauréat général which is divided into three main streams of study. The série scientifique (S) is concerned with the natural sciences, physics, or mathematics, the série économique et sociale (ES) with social sciences, and the série littéraire (L) focuses on French and foreign languages and philosophy. There are also many sub-streams, such as the série scientifique sciences de l'ingénieur (SSI), a série scientifique baccalauréat with two more specializations, génie électrique and génie mécanique. There is also the Bac STI, Sciences and industrial technologies. There also exists the option génie mécanique & the options electrotechnique). In all streams, students have philosophy courses in terminale, while French language classes end in the première, excepting the série L, where they become French literature classes. Students having followed the L series do not have enough scientific knowledge from high school alone to succeed in science university courses, therefore some combinations of baccalauréats and university programs are very rare. Description The sciences stream requires high-level mathematics (very heavily weighed), physics, and chemistry. The série ES is balanced between literary and scientific courses; students must take an economics and social sciences exams. The série L heavily weighs French language, history and geography and foreign languages; also including a literature section. Students must present examinations in one-to-three modern languages, and also have the option of presenting examinations for either Latin or ancient Greek or for both. The STPA and STAE stream are only available in lycées agricoles, specialty schools for agricultural sciences. The Lycée Professionnel leads to several different vocational diplomas in all fields of study. The enrolled students are not planning on a higher education. The schooling is vocational training as craftspeople and through internships in companies. It is a good track of schooling for students more interested in a hands-on educational approach than in academic schooling and learning. The first diploma, the CAP, requires two years of schooling. It usually prepares the student for a specific occupation: carpenter, childcare provider, tailor, and so on. It is the easiest diploma to obtain, requiring the least academic study. The second diploma, the BEP, takes three years of study after the collège. It leads to a professional qualification in a specific field, such as restaurant industry, metallurgy, and so forth. It is more difficult diploma to earn than a CAP diploma; some students who have earned a CAP continue to a BEP. The final diploma, the Baccalauréat Professionnel (the BP), is the highest professional qualification available. It can be obtained after three years of study after the collège, but most students first earn a BEP and then continue to a Bac Professionnel. ↑ 1.0 1.1 Francois Louis, Secondary Education in France: A Decade of Change (Organization for Economic Cooperation & Development, 1995, ISBN 9264145486). ↑ H. D. Lewis, The French Education System (London: Croom Helm, 1985, ISBN 0709916833). ↑ Discover France, Education in France: Part 1 (2007). Retrieved May 24, 2008. ↑ The France National Ministry of Education, Regristration (2006). Retrieved May 30, 2008. ↑ European Education Directory, France (2001). Retrieved May 26, 2008. ↑ The France National Ministry of Education, Bachelor Technology (2006). Retrieved May 26, 2008. Lewis, H. D. The French Education System. London: Croom Helm, 1985. History of "Secondary education in France"
This page was last modified on 26 August 2015, at 16:27.